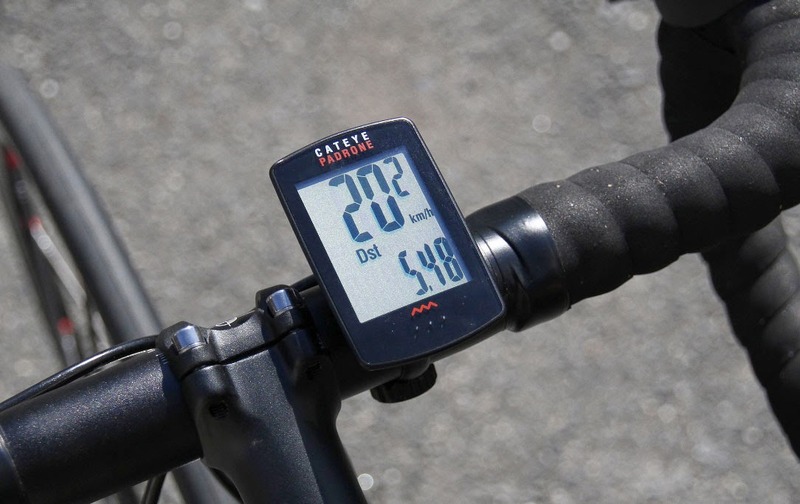 When we first introduced the new Cat Eye Padrone Wireless Cyclocomputer in December of 2013, we expected that it would be popular. Our hopes were confirmed, as it has now become our best-selling wireless bike computer! To provide squint-free viewing of information while you're riding, it has the largest screen available in the industry, with a screen that's 85% larger* while the unit is 22% thinner! 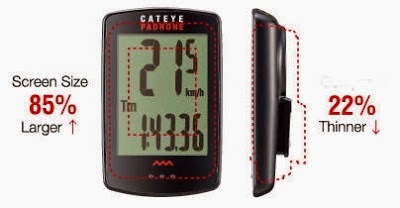 The CatEye Padrone Wireless Cycling Computer is now in stock in all three Century Cycles stores! 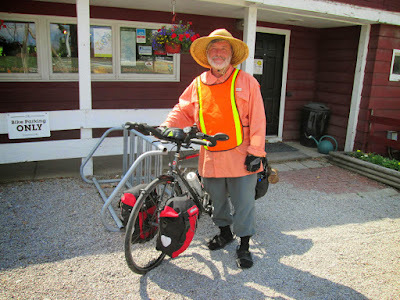 This gentlement stopped by the Century Cycles store in Peninsula this past Monday while on his way back home to Cleveland, after a bike touring trip of a few days down near Atwood Lake. He picked up those sweet red wool socks in our store to replace the rain-soaked ones he was wearing! Click here if the video above is not appearing for you. 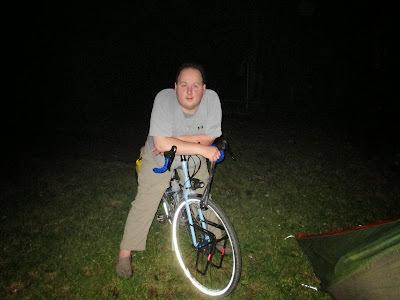 In case you're wondering, that Surly Troll bike that he's riding in the photo above is his NEW favorite bike! 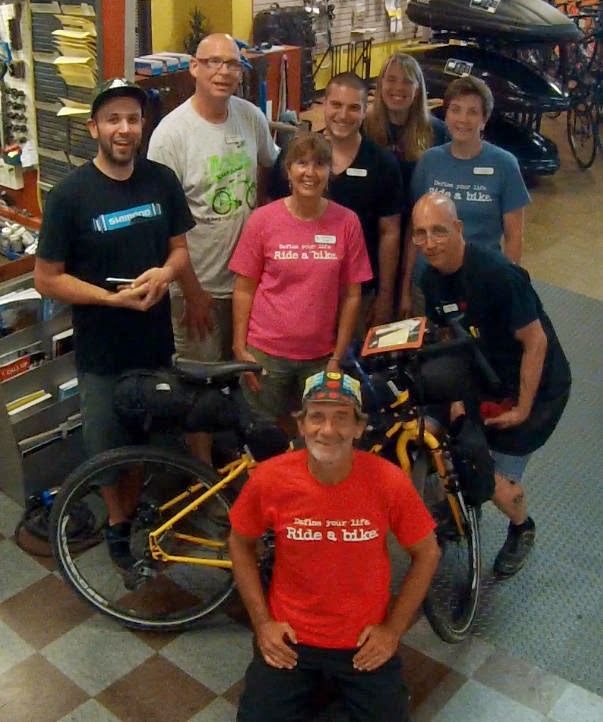 You can see more photos of touring cyclists who have visited all three of our stores in our Bicycle Touring Photo Gallery. 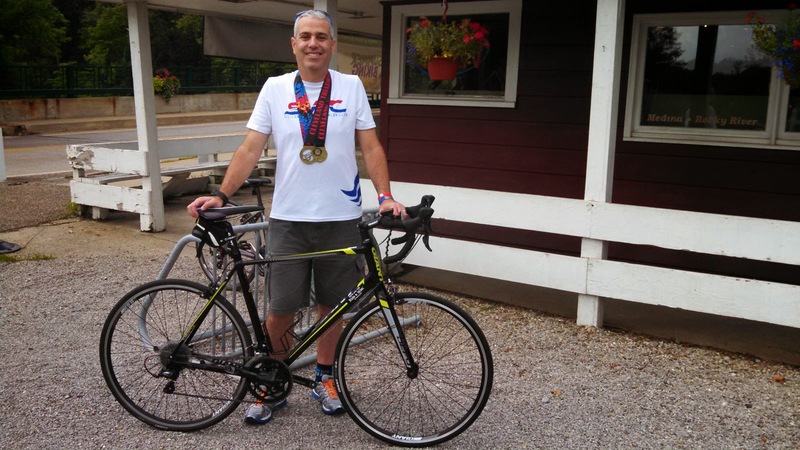 Triathlon racer places highly on Century Cycles rental bike! Allen was visiting Northeast Ohio this past weekend from San Jose, California. He participated in the Cleveland SuperSprint Triathlon yesterday, and used one of our rental road bicycles for the event. Allen ended up placing 2nd in his age group, and in the Top 10 overall! Congratulations, Allen! Our rental road bikes are the 2014 Giant Defy 3 and the Giant Avail 3, which sell for only $949.99 each for a brand new model, proving that you don't have to pay professional prices for a bike to get you on the podium! 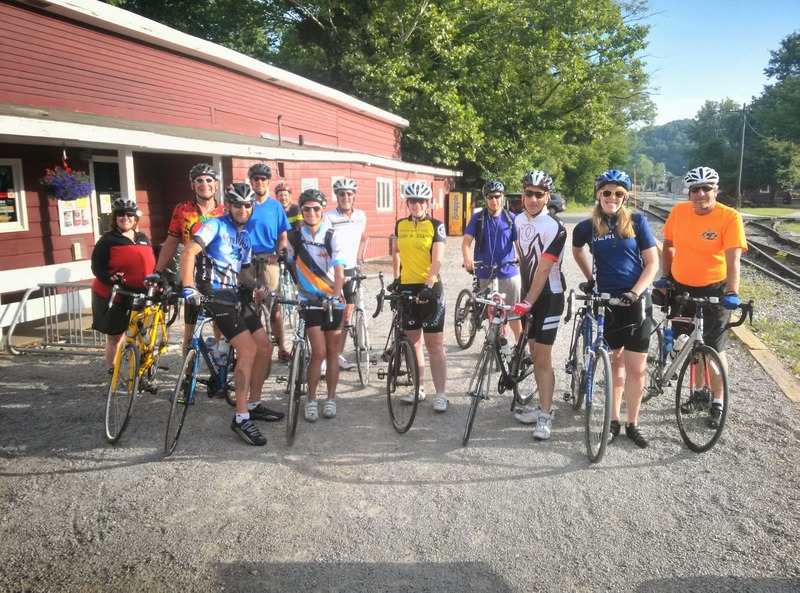 The Century Cycles store in Medina had 14 enthusiastic riders for our most recent Sunday Service Group Road Bike Ride on Sunday, July 20, 2014. Thanks to everyone for coming! Ride leader Cathy reports that they decided to increase their mileage and ended up with 29.33 miles at the end. Their pace was faster this time, as well. The skies were sunny and good conversations were had by all along the way. 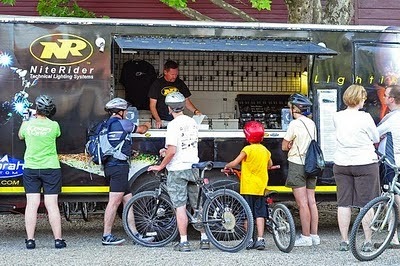 This Saturday: NiteRider Demo Night Ride on the Towpath Trail! 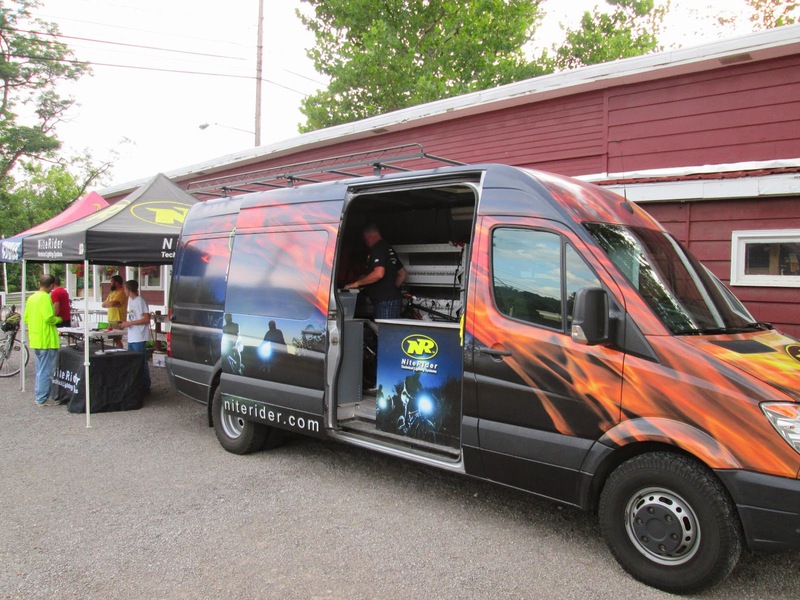 This Saturday, July 26, 2014, Tommy from NiteRider returns to Peninsula with the NiteRider Technical Lighting Systems road rig! 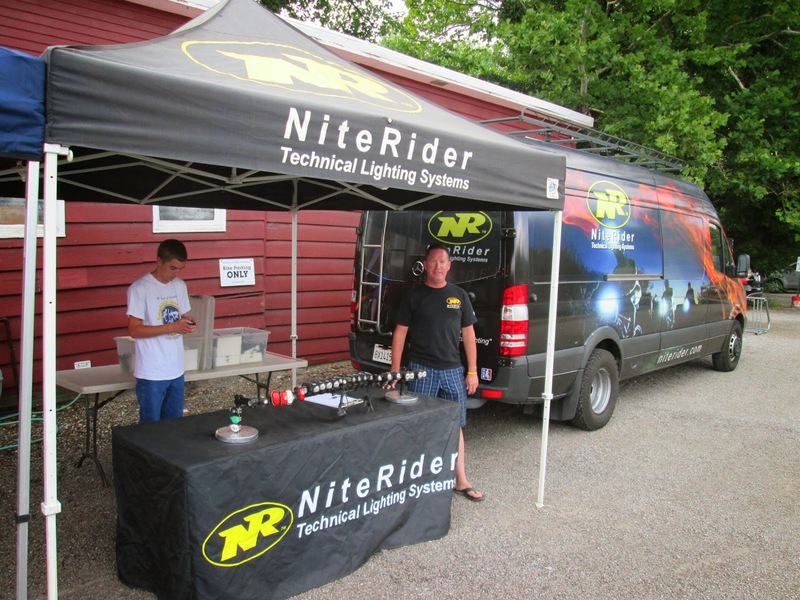 Starting about 6:30pm, sign up to demo NiteRider's latest high-end bicycle lights for FREE! 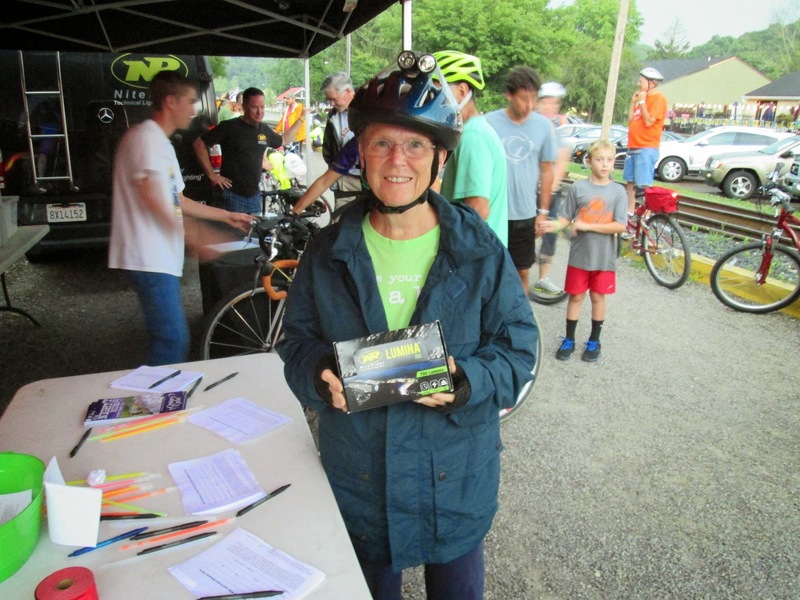 Plus, you'll get a chance to win a FREE NiteRider headlight! Our ride begins promptly at 8:00pm as usual. Your own bicycle and helmet are required. Children are encouraged to attend, but must be accompanied by an adult. 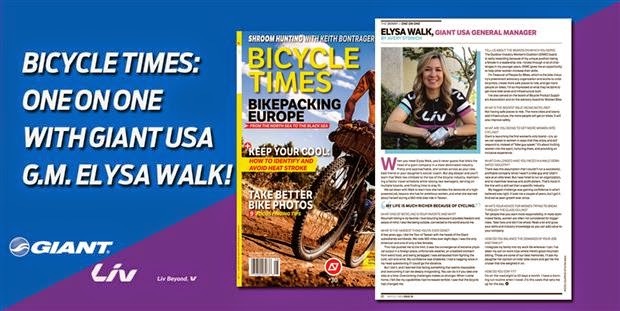 The latest issue of Bicycle Times magazine features an interview with Giant Bicycles General Manager Elysa Walk. Look for Issue #30 of the magazine on newstands today. You can read a few questions from the article on Giant's web site. 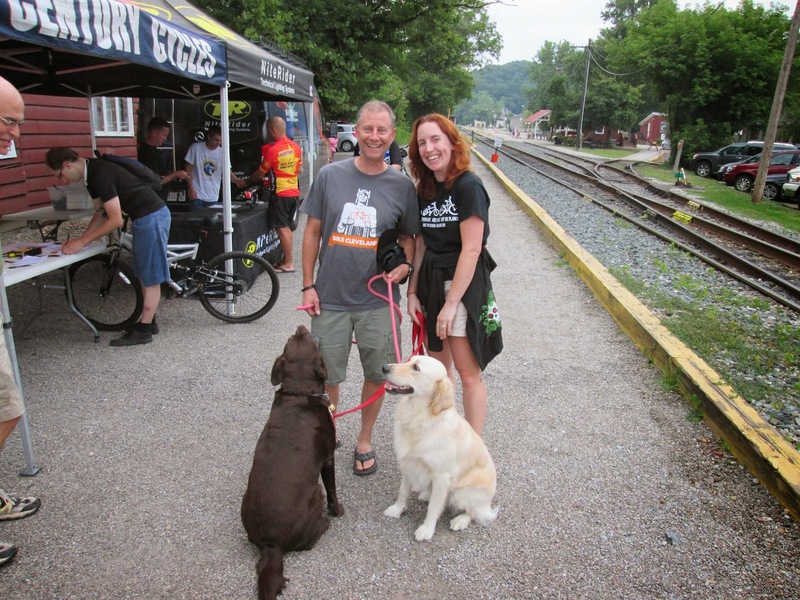 We featured Elysa Walk here on our blog earlier this year as being named "One of the 50 Most Influential Women" in the bicycle industry, and also for her popular TEDxWomen Talk. From July 21 to August 17, 2014, the Rocky River Green Team and the Rocky River Recreation Department will be hosting a special event. Anyone who rides his/her bicycle to the Outdoor Municipal Pool will have the option to fill out a raffle ticket at the front desk. These tickets will then be entered into weekly prize drawings. Prizes include Rec Center passes and Century Cycles Gift Cards! Dust off that bike and ride to the pool as much as you can. The more you ride, the more chances you have to win! 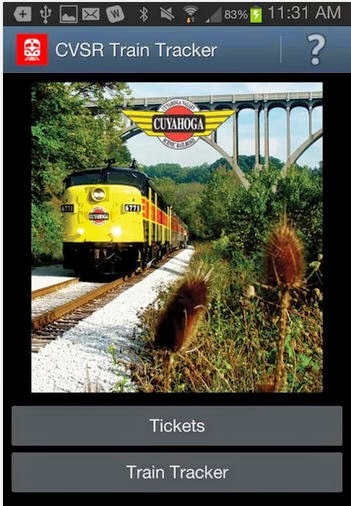 To help you plan your bike rides on the Ohio & Erie Canal Towpath Trail and the Cuyahoga Valley Scenic Railroad, the CVSR has developed their Train Tracker App! Available for iPhone and Android, the CVSR Train Tracker lets you see in real-time exactly where the train is located, and which direction it's headed. 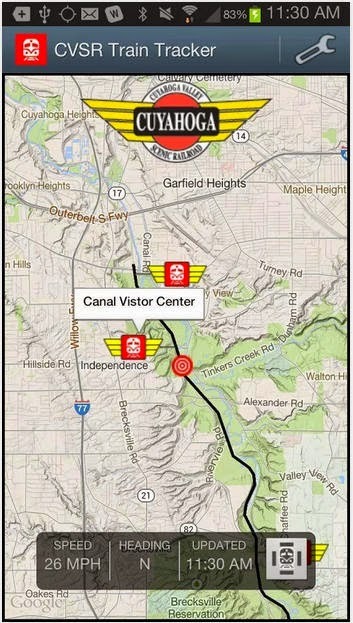 If you're using Century Cycles' bicycle rental service on the Towpath Trail and want to catch the Bike Aboard train, this can help you figure out when and where to be to catch the train! 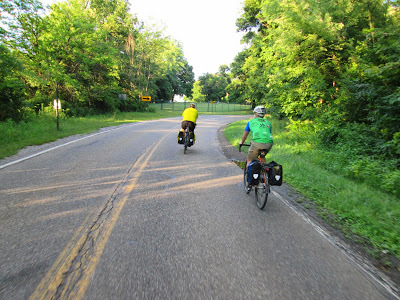 Many area riders have taken advantage of the pleasant weather we've had the past few days to get out on their bikes! 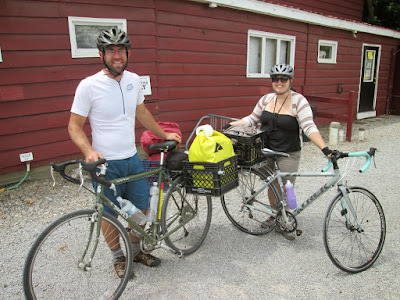 Ryan and Katie are Cleveland-area locals who are taking a short bike trip of a few days. They stopped by the Century Cycles store in Peninsula yesterday on their way down to their parents' cabin at Atwood Lake. They planned to camp in either Clinton or Massillon as they make their way south. 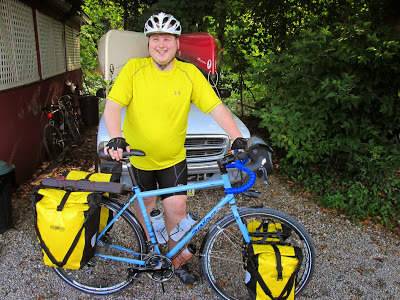 You can see more photos of touring cyclists that have visited all three of our stores in our Bicycle Touring Photo Gallery. When Sen. Pat Toomey (Republican-PA) attacked key funding for trails, walking and biking programs, RTC supporters responded by sending more than 7,000 messages to members of Congress. It worked. Thanks to people like you across the country, and the support of local groups in Pennsylvania, Sen. Toomey decided not to continue his attack. 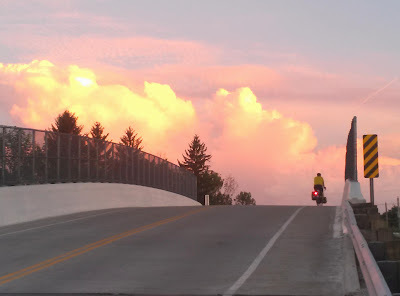 This means that the Preserving America’s Transit and Highways Act of 2014, a critical bill to continue funding of our transportation system, will now go to the Senate floor without any amendments that would eliminate funding for trails, walking, and biking. RTC worked with more than 80 local groups in Pennsylvania to stop Sen. Toomey’s amendment from going forward. The letter we delivered to his office, combined with the messages you sent, made all the difference. If you wrote to your Senators on the Finance Committee, shared our e-mail with friends, or called Sen. Toomey’s office, you made this victory possible! We feel confident that Senator Toomey will not try to introduce his amendment again, but we’ll be the first ones to let you know if he does! Read more details on the RTC Blog. 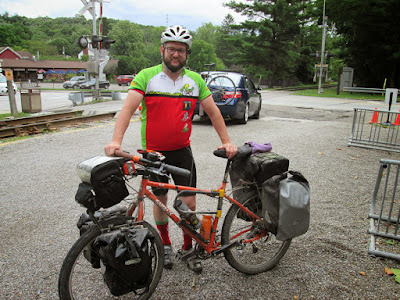 Mike Scully is riding from his home in San Antonio, Texas to visit friends in Albany, New York, and stopped by the Century Cycles store in Peninsula for some new brake pads. The theme of his trip is "Nothing Hard is Ever Easy." 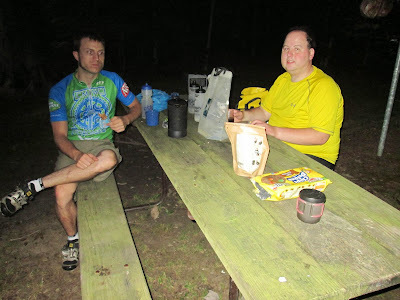 Mike said that the worst part of his whole trip was the most recent 10 miles, on State Route 303 from Brunswick to Peninsula! The best part, however, was also very recently, when a group of Amish let him draft off of their horse and buggy. He said, however, that being on that web site has exposed the idea of bicycling to a whole new audience. 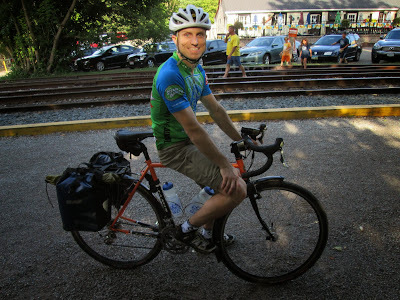 He's had a lot of questions and interest from his online friends, and hopes to inspire many of them (as well as many of the students at the high school where he teaches) to embark on a bicycle adventure of their own. 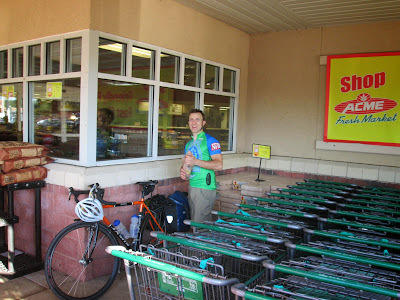 You can see more pictures of long-distance cyclists who have visited all three of our stores in our Bicycle Touring Photo Gallery. Limited-Time Summer Deal: Take 15% Off any regular-price summer jersey! It's still HOT outside, but that doesn't stop Century Cycles from offering you a hot summer deal! 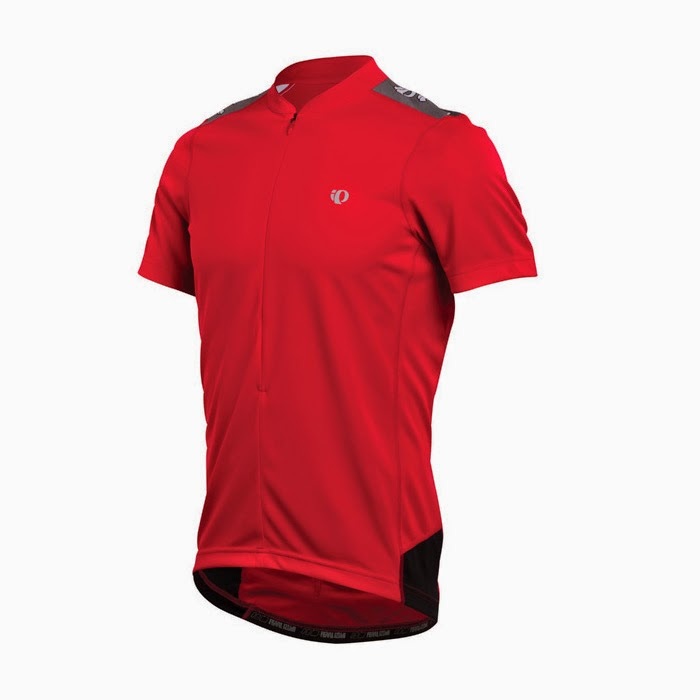 For a limited time, take 15% OFF any regular-priced cycling jersey! This applies to men's and women's short-sleeve or sleeveless jerseys. We have a wide selection available from Pearl Izumi, Bellwether, ZOIC, and more in all three of our stores (Medina, Peninsula, and Rocky River)! Please note: This offer does not apply to our Define your life. Ride a bike.™ jerseys. 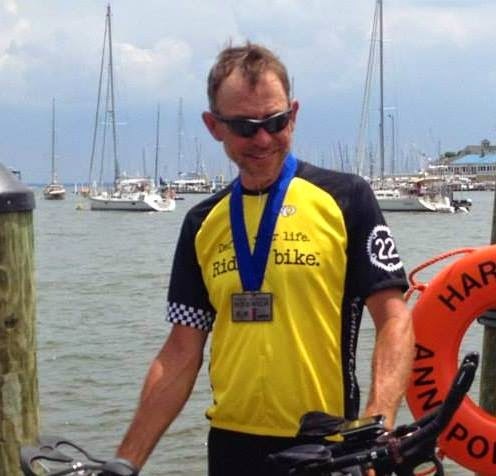 Most everyone is familiar with the Tour de France, but if you want to discuss a truly grueling cycling event, nothing tops the Race Across America (RAAM). 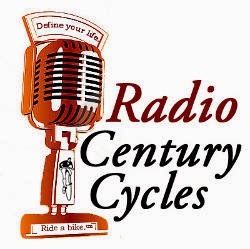 In the last episode of Radio Century Cycles, host Bob Soroky talked to Lon Haldeman, one of the founders of the race. 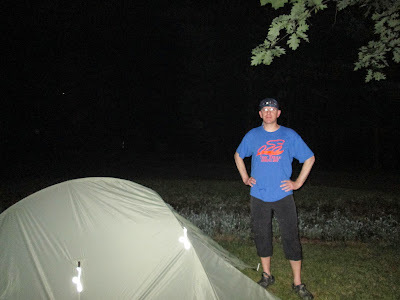 This time, we'll be chatting with local Ohio racer, Mike McClintock, who just completed the 2014 race from California to Maryland in 11 days, 20 hours! Hear his adventure first-hand! Go to http://bit.ly/TXdI7A at 10:30am on Tuesday, July 15, 2014 to listen live and call in with your questions for Mike. Or, listen offline any time after that! 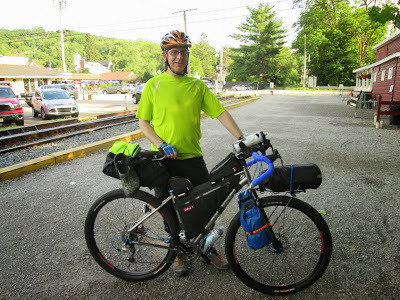 Win a free set of panniers from the Adventure Cycling Association! 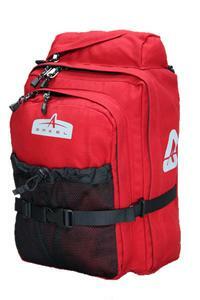 The Adventure Cycling Association is giving away a set of Arkel bicycle touring panniers! 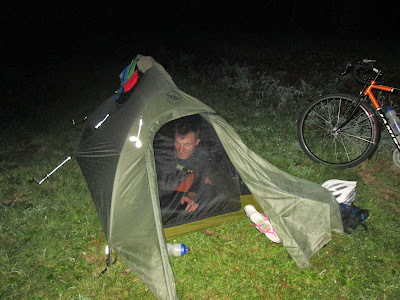 It's called the Pack Your Panniers contest -- just show them what you would pack on your dream bike tour to enter. As a nonprofit organization, Adventure Cycling Association's mission is to inspire and empower people to travel by bicycle. 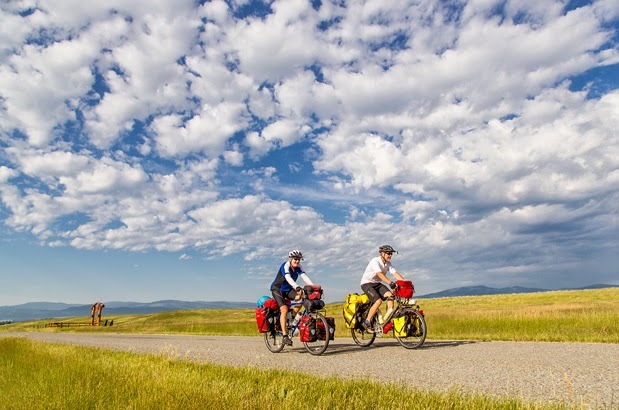 Established in 1973 as Bikecentennial, they are the premier bicycle-travel organization in North America with more than 35 years of experience and 47,000 members. 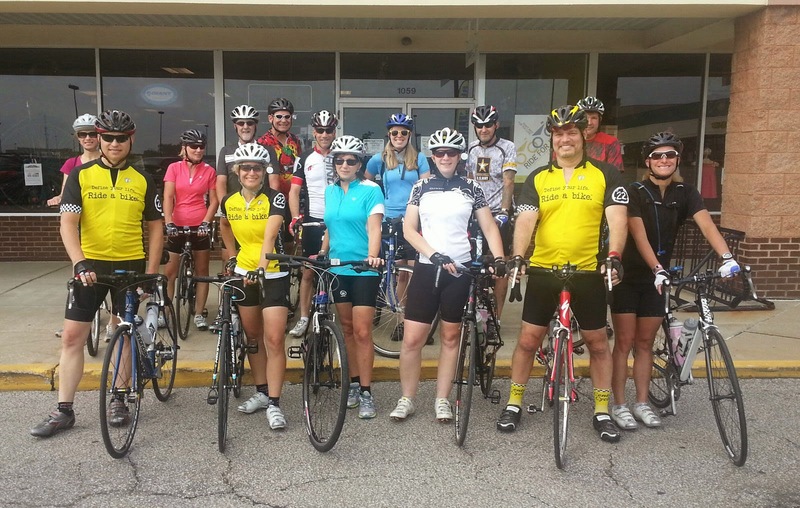 Century Cycles is a Bicycle Shop Member of the Adventure Cycling Association. Our Medina and Peninsula stores are located on the ACA's Underground Railroad Bicycle Route, and our Rocky River store is located on the Northern Tier Route. Thanks for riding with us this past Sunday in Peninsula! Thanks to the 13 people who joined us for our latest Sunday Service Group Road Bike Ride this past weekend in Peninsula! 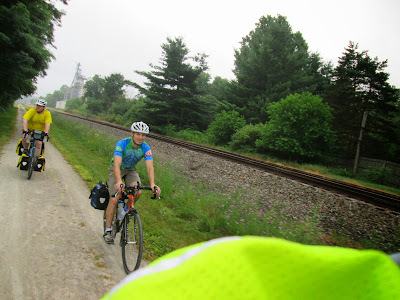 Our next ride is this Sunday, July 13 in Rocky River, then Sunday, July 20 in Medina. Did you know ... in addition to our comfort hybrid rental bikes for the Ohio & Erie Canal Towpath Trail, we now also rent road bicycles? 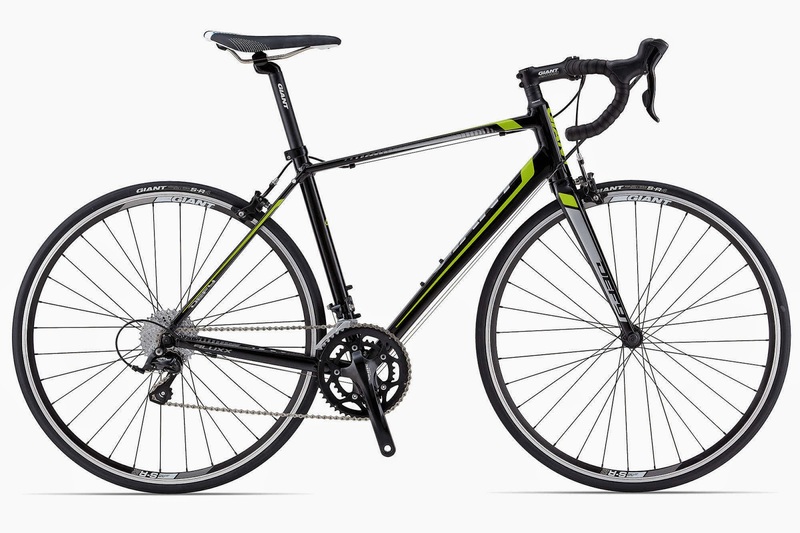 Road bikes are available for rent by the day, with discounted rates for 2-day, 5-day, and 7-day rentals. 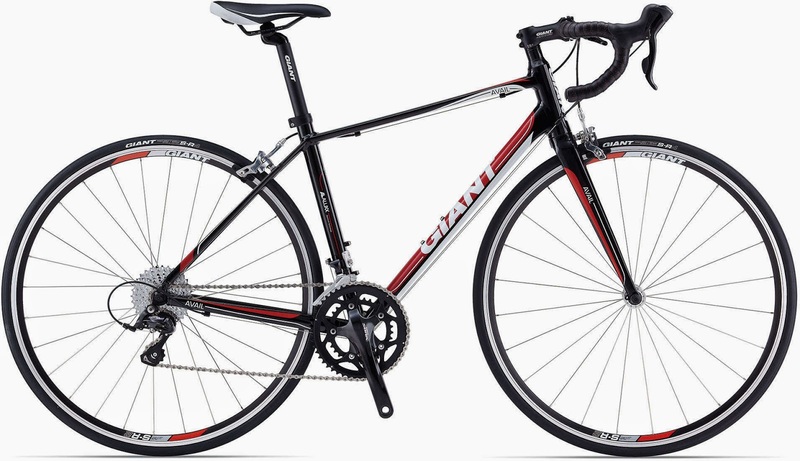 We rent the 2014 Giant Defy 3 road bike, and the women's-specific 2014 Giant Avail 3 road bike. Various sizes are available to fit most riders. One of our alert customers brought us this pamphlet for the Richland B&O Trail, and much to our delight, the cover features a cyclist sporting one of our Define your life. Ride a bike.™ t-shirts! You can purchase one of our Define your life. Ride a bike.™ t-shirts in any of our three stores. And of course, they are FREE with the purchase of any new bicycle! Contact your US senators TODAY to stop the attack on trails! Sen. Pat Toomey (R-PA) wants to eliminate federal funding for trails, walking and biking, and we need your help to stop him! Last week, Rails-to-Trails Conservancy sent an alert asking people to write to their Senators to save funding for the Transportation Alternatives Program (TAP)—and already, nearly 5,000 people like you have taken action! There's still time to speak out before a vote! Click here to use this EASY form to tell your Senators to vote against eliminating funding for the Transportation Alternatives Program! Once you fill out the form, if you're here in Ohio, it will automatically go to Sen. Sherrod Brown (D-OH). Unfortunately, you'll have to fill out a separate form to send a note to Sen. Rob Portman (R-OH), but the RTC web page makes that very easy. In his opening statement, Sen. Toomey said that places for walking and biking were “terrific to have,” but he also called them “unnecessary spending” of federal funds. We beg to differ! Every day, millions of Americans walk and bike or use a trail to get to work or school, go shopping, visit the doctor, or see friends and family. Now is the perfect time to let your elected officials hear from you. Write your senators and tell them walking and biking are important to you! Thanks for doing all you can to save funding for trails, walking and biking in your state—and across the country! 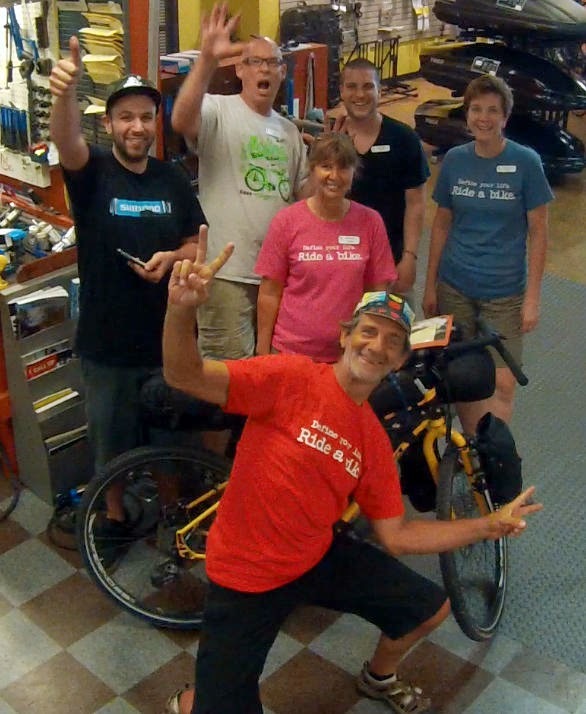 Passing through on his tour of the USA, Chuck Mitchell stayed the afternoon at the Century Cycles store in Medina to refuel, rest up, and don his new Define Your Life T-shirt with his new friends - the CC Medina gang! Of course, we also admired his Salsa Fargo 3 touring bike! All the best Chuck!